We are specialized in offering our clients a huge range of G.I. Conduit Fittings. These G.I. Conduit Fittings are manufactured focusing outmost quality and with the help of advanced technology. Clients can avail these G.I. Conduit Fittings at industry leading prices. Vishwakarma Brass Components was established in the year 1996. We are Manufacturer, Exporter and Supplier of Flat Type Test Clamp, Re-Bar Clamp, Brass Earthing Blocks, S.S Carbide, Reducing Hex Bush, E1W Brass Gland, Brass Bolts, Brass Nuts, Female Bushes and many more. 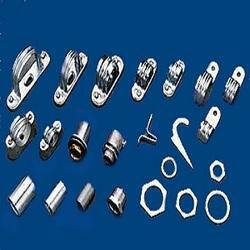 Our company is well–known and trustworthy name in the field of Brass components. It was established in the year 1996 with the vision to cater the requirements of customized Brass SS-Copper and aluminum components of any dimensions and specifications with quality. We are one of the largest manufacturer of brass components in India and abroad our machined components that are produced for various metals ranging from 0.50 mm to clients requirement. Our clients need is the main motto of the company on which it is executing since from 1996. The traditional relationship of pride of craftsman with his craft is combined with the speed and precision of modern machinery, to foster a new step of art and technology. We shall also strive for continuous improvement in our business. We shall periodically review our quality policy & objectives for their continued stability suspired to set new milestones in the field of Brass, M.S., S.S., H.S.S, Carbide, Copper, Aluminium, P.B., Gun Metal, Rubber, P.C., Plastic, Derlin, Teflon, Fiber Glass and Wooden component technology. The company has a daily capacity of 20 designs with the production of 50,000 pieces of each design so as the daily production bags to a total of 10,00,000 to 10,50,000 per day. The components vary in size ranging from 1mm to 100mm. For this an ideal synergy of precision in manufacturing, exacting quality control, optimal design and understanding the service environment is required. For customized brass components to cater to any industry our company are fully geared up to assist you in any time and every step of the way, from actual designing throughout production until delivery. Further, we make sure that all our products are of the highest quality as we carry a stringent quality test upon all our offered products. All our products have garnered immense attention in the market for their accurate dimensions, material used, rust resistance and durability. It is the impeccable quality of our products that has earned us a huge base of repute clients. Moreover, the team of highly qualified and experienced engineering staff is trained to design and fabricate quality range of products for valued clients. Our products can be customize as per the demand of the clients and meet their exact requirements. Additionally, in our endeavor to excel in industrial fasteners domain and create our name across the world, we are led by our honorable mentor Mr. Nitin Prajapati. His industry expertise and business ethics are facilitating us in staying ahead of our competitors. Moreover, we are also well supported by a highly professional team of experts, who is constantly working to improve the quality of our products. Today, we are an internationally known company catering to the needs of clients from all over the world. Through our wide spread networking web, we are effectively catering to the requirements of our large number of domestic as well international clients. Further, the ethical norms that we follow in our business approaches, have earned us a reliable name in our domain of work. This reliability, trust and respect for us, on client's part, always inspires and motivates us to do better. Our strong focus on the principles of "Selling Bigger Quantity with Lower Profit" lead to widen the clientele by retaining the older clients and gaining the newer ones.